This is the most potent anti-inflammatory smoothie recipe I could concoct based on my current knowledge, research, and ingredients on hand. Whether you’re battling a health issue (many of which inflammation is at the root of) or sore from an intense workout, reducing inflammation through a delicious smoothie is easier than most other modalities. There are a handful of spices known for their anti-inflammatory properties, four of which I included in this recipe. Turmeric, a new smoothie favorite of mine, ginger, cayenne pepper, and cinnamon, the first spice I began blending into smoothies years ago. Not only do these spices provide a wide array of health benefits, they imbue your smoothies with a wonderful flavor…if used in the right proportions. Let me quickly cover the ingredients that comprise this smoothie from top to bottom, starting with the liquid base, green tea. Green tea contains potent anti-inflammatory compounds known as flavonoids, which studies have shown help reduce the risk of cancer and heart disease. Next up are blueberries and papaya. The phytonutrients found in blueberries provide both antioxidant and anti-inflammatory effects in the body, and are responsible for many of the health benefits attributed to blueberries. Papayas contain the protein-digesting enzyme, papain, which when combined with vitamin C and E confers anti-inflammatory action. Chia seeds round out this smoothie. The high amount of omega-3s present in chia seeds combat inflammation, and help lubricate your joints. People suffering from arthritis often experience less pain and inflammation after consuming chia seeds for several weeks. And there you have it, my best effort at reducing inflammation through modern day blender alchemy. Enjoy! Load the ingredients into your high speed blender and blend for around 30-45 seconds or until your desired consistency is reached. I’d love to hear what you think of this Spicy Anti-Inflammatory smoothie, or if you try it out, in the comments below. Happy Blending! Loving these recipes! Will surely try to get others on this site! This looks like one serving? Are all your recipes generally for 1 serving? I am trying these anti-inflammatory smoothies will let you know if they work for me. What about almond milk, Pumpkin seeds or pumpkin oil and does it matter if you add different things in the smoothies or is it best to stick with the original? Also what about consuming the green tea leaves in the smoothies? What about Aloe Vera the clear part not the greens? Sure you can add whatever else (preferably healthy) you’d like to these smoothies. Green tea is good in a smoothie as is powdered green tea, not sure about the actual leaves, I guess you could. Aloe vera gel is fantastic superfood for your smoothies. its a good smoothie but it has a bite for sure hope it helps my arthritis??? I’ll try this recipe, but with a few modifications. I’ll substitute white tea which has less caffeine than green tea and more antioxidants. And since I don’t like anything spicey, I’ll just leave out the cayenne pepper and hope that the ginger will not be too spicey for me. I’ll add banana instead of cherries for the creamy texture. Also you might try adding a raw date to sweeten instead of honey or another sweetener for the fiber and vitamins and minerals. Thanks for the recipe! I love your creativity in modifying this smoothie to suit your preferences. That’s what it’s all about and what I regularly encourage on my site. Raw dates, yes, those are also a great option to sweeten. Enjoy! Hi Del, pineapple is a good substitute for papaya. Thanks for the tip on blending the spices and tea first – those will a less powerful blender will need to go that route. Nothing stuck to my blender, plus I used fresh papaya which is way better then frozen in my opinion, and I use fresh blueberries. I freeze them myself. YUM! I added a medjool date along with the spinach add-on. I will be adding this to my delish smoothie recipe list. A Medjool date and spinach, nice, thanks for sharing. Pineapple is actually one of the best antiinflammatory foods there are! But only if it’s fresh, not canned or dried. I am not a fan of papaya, so I substituted that with about 1/4 of a large, fresh pineapple and added an avocado for more flavor and nutrients. I also used fresh, chopped ginger and ground flax seeds. Thanks so much for this recipe! I know I changed it around a bit, but it was an excellent place to start and I drink this every day now. It has really helped a lot, too! Not sure how I overlooked pineapple and its powerful anti-inflammatory affects. Thanks for the heads up. Substituting fresh pineapple for papaya, adding an avocado, and ground flax seeds to make your own unique creation brings a huge smile to my face :) That’s precisely what I’d like others to do. Thanks for leaving such a great comment. Oh, and one more thing! I was doing a bit more research on turmeric and found that it’s actually not very effectively absorbed in your gut unless it is cooked with olive oil and black pepper. For this reason, a lot of turmeric and curcumin supplements have black pepper incorporated into them. I added 1/2 teaspoon black pepper and a tablespoon of olive oil to the mix and it didn’t change the flavor much. I need more research to figure out the exact correct ratio. There is also an inflammatory rating system called IF rating that is very useful! Just Google that and you will find more information. Fresh parsley is a great antiinflammatory food and is wonderful in these smoothies too! Sorry I can’t post any links from my phone. Ps – Unfortunately, the best antiinflammatory is still illegal in most of these United States. If you live in Colorado, California or Washington state, try to find some CBD-rich strains and talk to a cannadoctor. That discussion unfortunately belongs on another board. Thanks for the info on turmeric. I’ve actually heard the same thing, and often sprinkle it and black pepper on my eggs. I’ve only used black pepper with turmeric in a smoothie a couple of times. According to my local go-to homeopath, turmeric and fish oil taken at the same time on an empty stomach is a potent anti-inflammatory combo. Yes turmuric is only effective with bio perrine. Cayenne pepper is a night shade and not recommended for those sensitive to night shades. Thanks for the recipe. I was looking for a good anti inflammatory smoothie and came across your blog. Had a variation on your recipe already prepared so just added the spices and wow, it’s good. Sprained an ankle a few days ago so this is a keeper. This is one of my most popular recipes, among readers and myself. The spices are key. I hope your ankle is good as new in no time. I made the smoothie, and I couldn’t even smell it without gagging. I tasted it and gagged. I love all foods, especially spicy foods, especially garlic but this made me want to throw up. I re-made it without the spices. Delicious. I’ll consume those spices in other foods at taste good thank you! Fruit and garlic just doesn’t do it for me. This was wonderful! I’ve been incorporating turmeric and ceylon cinnamon into my smoothies, but your additions were great! Because this was a meal, I added a cup of spinach, a carrot, raw cranberries and some coconut milk. I used mango instead of papaya… no sweetener. Added a tiny bit of ground black pepper to help the turmeric. Very tasty with a little kick. For those not used to using chia, if you are going to let it sit for any amount of time you will need to add more liquid and it is very quick to absorb all the liquid and you soon have a gelly rather than a smoothie :p Thanks for sharing!!! Great to hear you enjoyed this smoothie and made several modifications to create your own unique concoction! I can’t emphasize enough how important that is. Everyone has different nutritional needs and taste preferences. No sweetener, nice. Black pepper to potentiate the effects of the turmeric, very nice. I often forget to make that point about chia seeds, and gelatin, let it sit and it will gel up. I was wondering…must you let the Chia seeds gel up prior to drinking it. I would love to try this smoothie because I love spicy drinks and need the anti-inflammatory properties of this smoothie. Is it okay to drink it right away or must you wait for the Chia gel up. Also, do you know how much this recipe yields. I am only making it for one and would like to add the spinach. Should I cut it in half? You can either use chia seeds or chia seed gel (make before adding into your blender). You don’t need to wait for them to gel before consuming the smoothie. This recipe yields one large serving size. If it seems like too much for you please do reduce the amount of each ingredient. Serving size depends on a number of factors such as weight, health goals, activity level, etc. Would a chocolate protein powder EAS work in this? EAS chocolate whey protein will work. It’s not organic, which I would opt for, but a good option. I have trigeminal neuralgia and was wondering if these smoothies would help. That’s a tough one. Reducing inflammation helps alleviate many health issues, but I’m not sure about trigeminal neuralgila. This is actually the first I’ve heard of the condition. Personally, I would try alternative medical therapies like acupuncture, chiropractic, self-hypnosis, or meditation. Fantastic, Bobbye! All of those spices, especially fresh, are a winning combination. Great recipe. I put only a dash of cayenne & had to use cherries instead of papaya (couldn’t find it this time). Tasty & good for you. Nice to hear you enjoyed this recipe, Kristen. Cherries in place of papaya was a nice substitute. Wasn’t sure about this one but gave it a go, will go a bit lighter on the cayenne but it was really quite tasty. Couldn’t find fresh or frozen papaya so substituted with frozen mango. Will definitely include this in my food regime. My Nutribullet was delivered today. This was my first recipe – I have inflammatory arthritis – and it tastes delicious, thank you. I used frozen blueberries, fresh papaya, fresh root ginger, but didn’t add any sweetener. I also added spinach and about a teaspoon of coconut oil. Just the right amount of everything, for my taste. Anything with cinnamon and ginger has got to taste good, right? Will be trying more of your smoothie recipes, I’m sure. That’s pretty neat that you broke in your Nutribullet with one of my recipes :) Great to hear you enjoyed this recipe. Here’s to many more nutritious and delicious smoothies! A few months ago I had overall body hives that would keep me up at night. One of the only ways I could sleep for a few hours was to ice the hives. As you can imagine, this is not the most restful way to rest and repair! I found this drink recipe and decided to give it a shot. After consuming just one serving before bed, I slept all the way through the night for the first time in a month! I started drinking the concoction every night before bed until the hives subsided. It really was a miraculous intervention! It is now a part of my Hive Emergency Kit! Wow, that’s quite a testimonial for this smoothie and to the power of these anti-inflammatory spices. Thank you for sharing this, Colista, and you’re very welcome for the recipe. I have fibromyalgia and chronic fatigue. Pain and fatigue are the most prevelent life altering symptoms ,howrever those who suffer from these illnesses battle many other symptoms;which can make treatment very difficult. I have a very sensitive stomach and cannot tolerate anti-inflammatory medications. My concern is that ginger and cayenne pepper will definitely cause stomach upset. I see that many people have made needed changes best for them. Ginger is usually used to soothe an upset stomach. Ginger teas and ginger ale settle nauseausness. I have arthritis of the spine (ankylosing spondylitis) and have been taking NSAIDs for over 40 years. My last colonoscopy revealed that I had ulcers throughout my colon, directly attributed to the NSAIDs. I had to quit taking them and my doc suggested just taking Tylenol but it was not nearly strong enough. I decided to search out alternatives and ran across this recipe. I am a natural skeptic and didn’t think it would work, but I figured it was worth a try. I made a couple substitutions (banana instead of avocado, pineapple instead of papaya, blueberries as the other fruit, whole flax seeds added for fiber). I started drinking this every morning for breakfast. I didn’t notice any effect for the first few weeks, but after about a month, I realized I was pain free. I still take two 8-hour Tylenols morning and night, but I feel better now than I ever did taking NSAIDs. I haven’t tried eliminating the Tylenol yet, but I suspect I will. I’ve been drinking this for about 4 months now and I will continue to do so for the rest of my life! I wouldn’t claim it will work for everyone but it has certainly made a big difference for me. Thank you for sharing your success with this smoothie, which is absolutely wonderful! It will certainly provide inspiration for others. Kudos for sticking with it for a month. That’s how most natural remedies work. They take time. Time that allows your body to heal. I, too, have osteoarthritis, plus Cervical Spondylosis and chronic migraines. I am only 35 and can’t see myself taking prescription NSAIDs and muscle relaxers and whatever else they put me on to manage pain for the rest of my life…hopefully I still have a long time to go. I have so much inflammation that it’s visible in my shoulders and neck. It’s tender, painful and unattractive. I came across this recipe because my Chiro suggested an Anti-inflammatory drink with tons of celery (green face). It did not cooperate with my taste buds. 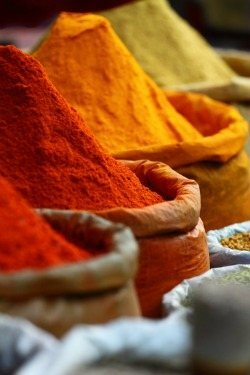 I love all things spicy and I’m all for trying natural pain relief (there is no cure for me). I LOVE THIS DRINK! It’s got a big kick, so I added an extra 1/2 cup of pineapple and it’s perfect for me. I noticed less inflammation that night! Thank you for sharing your gift with the rest of us. I will be drinking this smoothie everyday for the rest of my life. I’m elated hearing of your success with this smoothie, Dionna! I tried this today but did not have papaya so I used Mango. Wish I could find frozen payaya. I also used some unsweetened lemon green tea but used 2 cups for more liquid. It was very good so I’ll see what my wife thinks. Mango is a great substitute for papaya. Hopefully your wife enjoyed it. Your recipes are quite intriguing. I do have a problem with them however because I currently have chronic kidney disease stage IV and cannot take any NSAIDS and I must limit my potassium. One of the worst for me is banana and dairy milk so I avoid high potassium foods, especially dairy milk which has 450 mg of potassium in 1 cup. I use almond milk. I am going to experiment using frozen pineapple as opposed to banana or mango or papaya. My wife buys chia seeds to add to her cereal so I use that also. Do you have any suggestions for an anti-inflammatory smoothie that would fit in with a low potassium diet? I’ve never paid close attention to potassium content of fruit. Normally, I recommend avocado to anyone who doesn’t do banana, but it’s even higher. After running a few searches, I found that apples and berries are good smoothie ingredients low in potassium. You can modify the recipe above by substituting an additional 1/2 to 1 cup of blueberries, blackberries, raspberries, strawberries, or a combination of berries for the mango and avocado. Can this recipe be frozen or does it need to be made fresh? You can use frozen ingredients for a “cooler” smoothie or you can freeze after making, whichever you prefer, Randi. Is it better to use fresh turmeric and fresh ginger when making the anti-inflammatory smoothie recipe instead of the powdered? Do you also have some other great anti-inflammatory recipes? I have been drinking frozen blueberries and pinapple, ceyenne, cinnamon, flax seed oil, 1 scoop of yellow pea protein from NOW brand, kefir, and rice dream for over a week now. I havent needed any Ibuprofen! I have been suffering from sciatica since 2014. I dont need the ibu anymore as long as i drink this smoothie stuff! Scar tissue from surgery had been pressing on the nerves in the lumbar region. This stuff is amazing! Thanks so much! Ibuprofen is so bad for you. Fantastic, Smoozer! You’re welcome and great to hear you’re off the Ibuprofen. Looking for ways to reduce inflamation.. I would love to be able to have some of the smoothies you provide recipes for, but I am diabetic and the smoothies I have seen run in the mid 40’s carb content range. This is way too carbs to be able to have this as a drink or supplement. Is there any chance that you have some smoothie recipes that do not have a high carbohydrate content? I would love to try some of the anti-inflammatory smoothies but cannot chance my blood sugars going too high. Incorporate some of the spices for this recipe into these smoothies. This smoothie is awesome! The cayenne pepper in a cold drink is such a wonderful feeling. After the first spicy sip all the fruity flavors come through. I made a few substitutions based on what I had on hand and each time it’s been delicious. Made it today for my ailing co-workers and they all loved it! Always nice to hear my smoothies described as awesome :) Your co-workers are lucky to have someone making healthy (and nutritious) smoothies for them. How often and if what duration should you drink the smoothie to have a result in reducing inflammation. Many Thanks. Try consuming this smoothie 3-5 days a week for a couple of weeks, Melanie.